Sehr gute Wahl, freue mich auf weitere Bewertungen. Hatte mir es jedoch etwas ausführlicher vorgestellt. Ich weiß, der Stress ist da und es ausführlicher zu machen, wäre schwierig, aber bei einem Spiel aus der Mario-Serie, das doch bestimmt sehr viele bewertet haben wollten, wäre etwas mehr vielleicht besser. Trotzdem super und weiter so! 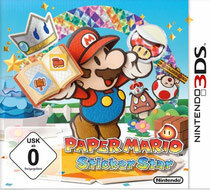 Auch die 3ds-News im ganzen sind TOP! My partner and I stumbled over here coming from a different page and thought I should check things out. I like what I see so now i'm following you. Look forward to checking out your web page for a second time. It's actually a great and useful piece of information. I'm satisfied that you shared this helpful info with us. Please stay us up to date like this. Thanks for sharing. First off I would like to say awesome blog! I had a quick question which I'd like to ask if you do not mind. I was interested to find out how you center yourself and clear your thoughts prior to writing. I have had a tough time clearing my thoughts in getting my ideas out there. I truly do enjoy writing but it just seems like the first 10 to 15 minutes are generally lost simply just trying to figure out how to begin. Any recommendations or tips? Kudos! Hello! I know this is kinda off topic however , I'd figured I'd ask. Would you be interested in trading links or maybe guest writing a blog article or vice-versa? My blog goes over a lot of the same topics as yours and I feel we could greatly benefit from each other. If you are interested feel free to send me an e-mail. I look forward to hearing from you! Great blog by the way! Appreciating the hard work you put into your blog and in depth information you offer. It's awesome to come across a blog every once in a while that isn't the same outdated rehashed material. Great read! I've bookmarked your site and I'm including your RSS feeds to my Google account. Good response in return of this issue with solid arguments and telling the whole thing regarding that. I blog quite often and I truly appreciate your content. The article has truly peaked my interest. I will bookmark your blog and keep checking for new details about once a week. I subscribed to your RSS feed as well. If you would like to take a good deal from this piece of writing then you have to apply these techniques to your won website.